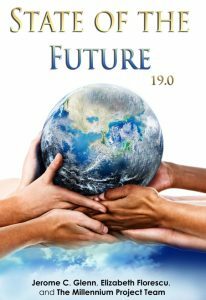 The Millennium Project’s latest report – the State of the Future 19.0- has recently been published. This publication is one of the few that looks broadly at the present and future of humanity. As a futurist, I find it has always provided a wider scope of analysis about the present issues than most other reports or publications. As in the prior 18 publications, this new one looks at humanity through the lens of 15 global challenges we face. In addition, a good bit of the work, insight and research comes from 63 nodes around the world. The combination of these two dynamics – a range of 15 critical areas researched from a truly global network of thinkers- is what makes the Millennium Project unique. The 15 topics include topics I spend a lot of time researching and thinking about such as sustainable development and climate change, rich-poor gap, clean water, population and resources, global convergence of IT, energy and science and technology. In these areas, the State of the Future provides a ground up global perspective of value on these topics. Then there are the topics I rarely track at a global level where the insight and foresight of the SOF publication inform me. These areas include health issues, transnational organized crime, global ethics, status of women, and global ethics. Reading in these areas expands my sense of the world and the directions it is going in respective categories. I first became aware of the Millennium Project and its’ State of the Future publications more than 10 years ago. I was fortunate to be invited to attend a conference at the Foundation for the Future Foundation in Seattle. [Note: due to the passing of the founders this foundation no longer exists but has been supplanted by a newer organization of the same name in Connecticut]. The title of the conference, which I reported on in this blog in several columns was Energy Challenges: The Next Thousand Years. One of the people attending was Jerome Glenn the founder, leader and guiding light of the Millennium Project. He was one of the few futurists in the room as most other attendees were scientists, so I naturally gravitated to him. We have remained in touch over the years as I have consumed several SOF publications and have attended several World Future Society conferences where he is a regular. It was Jerome who recently sent me the latest 19.0 version of the SOF. Attending this conference in early 2007 was truly the eye-opener for me relative to the future of energy. Every single participant took the Foundation for the Future to task for framing the conversation about energy for the next thousand years. The unanimous point being made was a simple one: if we don’t focus on the next 50-100 years relative to the future of energy there might not be civilization or humans in a few centuries. The need to move away from fossil fuels ASAP has been the clear reality for me ever since. When a room full of some of the brightest scientists, physicists, visionaries and public intellectuals in the world are unanimous in having great concerns for the future of humanity if the use of fossil fuels continues unabated, it has an effect on one’s thinking. I would highly recommend the State of the Future 19.0 to anyone who thinks about, is concerned about, or is intellectually curious about the state of humanity as it exists today and might evolve in the future. It is well worth the cost and is available here. In a world where the main stream media is largely lowest denominator group think and much of the sites on the Internet are niche silos, this report is a refreshing broad and global look at our world and where it might be going.